I was looking through my old car show pictures the other day, and I started noticing all the '57 Chevy pictures I've taken over the past year. There are more than you might think, considering that if there's a big display of cars, I tend to skip over '57 Chevys sometimes. Not because I don't like them. But there are just so many of them. 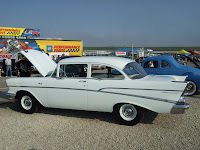 I went someplace a few weeks ago that had a cruise scheduled, only one car showed while I was there, and it was a '57 Chevy. Why are there so many of these around, anyway? Well, they’re the car you would most expect to see in a movie about the '50s, in magazines, in books, or reviewed in the classic cars section of the newspaper. They’re the subject of toys and models in every size and style. They’ve been featured on neon signs, kid’s hamburger meal boxes, and portable radios. It is easy to throw the word “icon” out there on things that don’t deserve it. But this is the granddaddy automotive icon that transcends all others. Just look one of them. Every angle, every curve, every part has been so frequently rendered that the ’57 Chevy is burned into our consciousness. But why? What is it about this 52-year-old budget-minded people-mover that has endeared itself so deeply in our culture? When they were new, ’57 Chevys were pretty popular. But what might not be indicative by the Chevy-to-Ford ratio at the local car cruise, Ford actually outsold Chevy in 1957 for the first time in some 20-years. At the time, people did like the Chevrolet, but Ford introduced a lower, sleeker car in ’57 that appealed to more buyers than the boxy ’57 model. Really, the story of this car begins in 1955, when the first of the “Tri-Five” Chevys was introduced, along with the red-hot small-block V8. It was that engine, probably more than anything else, that really vaulted these cars into the stuff of legend. The appeal of cheap speed appealed to the young and young at heart. And with the engine size increased to 283-c.i, up from 265-c.i. the two years previous, the ’57 was the strongest of the litter. injection option in 1957. This wondrous new technology increased horsepower to 283 (250-h.p. with hydraulic lifters). In reality, the fuel injection was somewhat fickle to work with and fairly expensive, but it showed that Chevrolet was at the forefront of technology and performance. The Chevrolet came in several body styles, trims and option packages in 1957, but the one that captures most of the headlines is the Bel Air two-door hardtop. The brushed aluminum appliqué along the sides of those well-known fins, the dual gun sight hood ornaments, and those three chrome hash marks on the front enders define the stereotypical style of the 1950s. Another configuration that has really taken off as of late is the sleek, two-door station wagon known as the Nomad. These were basically the same car as the two-door hardtop, but their long roof styling came straight from the GM Motorama circuit. With as many ’57 Chevys that turn up at car shows, some people have joked that there must be more of them now than there were when they were new. Of course, that was meant as a joke. Or was it? The fact is, aftermarket parts supplier Cars, Inc. can build a brand new, turnkey ’57 Chevrolet convertible from the ground-up. That’s right—these cars are still so popular that all of the pieces required to build one from scratch are still being manufactured. Amazing. 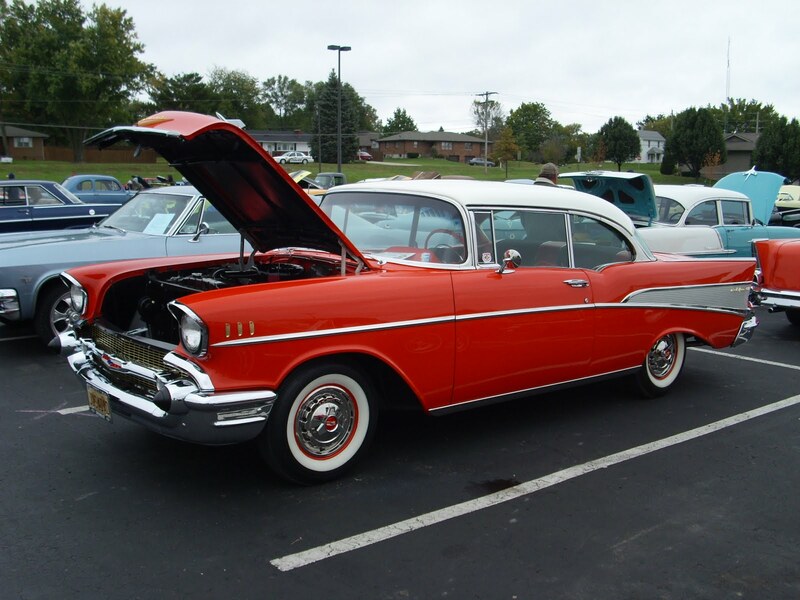 The 1957 Chevrolet was popular when it was new, but it has become even more popular today. 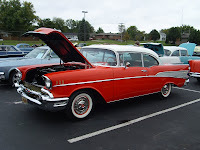 To that end, I went through a few of my car show pictures from the past year and pulled out some of the '57 Chevy pictures for your viewing pleasure. I even pulled one from a model show. Heck, if I had planned to write this story all along, I would have taken a lot more of these pictures. At any rate, enjoy the slideshow below. Same with a '69 Camaro. You can't go to a car show or to the drag strip without seeing at least one! That's true. Of course, my wife's favorite car is the '69 Camaro, so they're usually a pretty welcome sight when the family heads to a car show.